Chicken is a versatile food rich in high-quality protein. You may cook it many ways, combined with a wide variety of herbs and spices. Chicken is a flavorful and delicious nutrient-rich food. Skinless poultry, such as chicken, is lower in total and saturated fat than most beef. It is available year-round and it a good source of several B vitamins, including niacin or vitamin B3, pantothenic acid or vitamin B5 and vitamin B6. 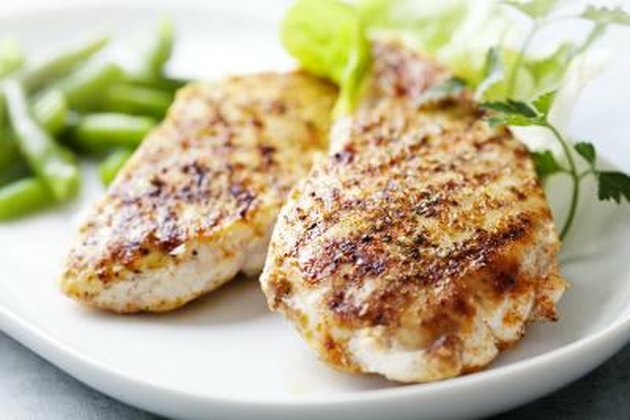 Cooked chicken breast is an excellent source of vitamin B3 or niacin. A 4 oz. portion provides 14.41mg, meeting 72 percent of the recommended daily value, or DV, for this nutrient. According to the Linus Pauling Institute for Micronutrient Research, niacin is necessary for energy metabolism, particularly for converting carbohydrates into energy the cells can use. Other functions of niacin include manufacturing cholesterol and fatty acids. Vitamin B5 or pantothenic acid is also found in chicken. A 4 oz. portion of cooked chicken breast provides 1.06 mg, or 10.6 percent of the DV for this nutrient. According to the NutriStrategy website, pantothenic acid aids energy metabolism, like most B vitamins, helping to turn carbohydrates and fats into usable energy for the body's cells. Other functions of this essential nutrient include supporting proper function of the adrenal glands, ensuring adequate production of healthy fats in your cells and contributing to healthy hair, skin and nails. Chicken and poultry in general is one of the best food sources of this important vitamin. A 4 oz. serving of roasted chicken breast provides approximately 0.64mg, or 32 percent of the DV for this nutrient. Vitamin B6 performs many important functions in the human body. It is needed for the synthesis of neurotransmitters, or chemical messengers in the brain as well as to form red blood cells. Vitamin B6 is essential for converting stored energy, in the form of glycogen in the liver and muscles to glucose for readily available energy. In addition vitamin B6 helps to break down proteins and supports a healthy nervous system, according to the National Institutes of Health. Why Is Chicken Healthy to Eat?